During my series of notes in the run up to Nigeria's fiftieth independence anniversary, I expressed a desire to grow Nigeria's entertainment industry into a world class one where we would see Nollywood movies being played in theaters and grossing hundreds of millions of Naira as well as have recording artists like Tuface Idibia, Dbanj, Banky W, P-Square, Timi Dakolo, Weird MC and co selling millions of records and generating wealth for themselves, their record companies, marketers and tour promoters and by so doing expanding the non oil sector of the economy. Wishing them a successful translation of their plans into reality. Did he just say,'' 30 billion Naira may be small?''. Wonders will never cease. Yet workers are still owed months arrears!!! Investing money in mediocre acting. Goodluck. Pun intended. When the government does not invest, Nigerians complain... and when the government decides to invest, Nigerians complain again... aha my Naija people...nothing makes you happy... Linda, this is very good news because this can reduce the high unemployment in Nigeria and hopefully generate and increase our economy. You guys have no idea how Hollywood sustains part of America's economy. Goodluck, you really are creating hope and dreams for the Nigerian youths. May the Lord guide you in making wise decisions. linda did u just change the title of this post?i'm seeing something different. am sorry that am not jumping with joy bc i need we need electricity non stop, better schools and hospitals before entertainment industries! n did i forget better roads??? this fund and however they wasted in jubilee spendingwould have put electricity in d whole nigeria!!! It amazes me dat they just dont get it. With nonstop electricity, people will invest, nigerians n non nigerians. i know my brother and a lot of his friends alone would hv invested in companies in naija. even i hv a great biz idea in medical sector dat will save lives, put money in ma pocket n provide employment to many families but wo constatnt electricity, i cannot even dare. just moho! luciferians are the Illuminati. The Illuminati are Luciferian (Masonic/Occult whoshippers). People should take a chill pill abeg,is one thing at a time. He's gonna try his best to work on other areas but please y'all should learn 2 appreciate abeg. Anyways u can never please everyone..
linda! u changed the title of this post to make it sound more industrious of Goodluck. There are much more important things the money could have gone towards. Why should Nigeria as a country not be able to supply its nationals with constant electricity. The money could have also gone towards education. Abeg Jonathan we are not impressed by this useless investment. Yes oo..he has invested it into the ockets of all the Niher delta musicians plus stupid ones from other tribes that did his campaign song...abi no be enterttainment industry them be....roflmcao.. goodluck to everybody, goodluck Nigeria eeeee! Anonymous5 nawa fo youooo! U no understand, the country needs more musicians not university graduates so that we can all sing their praises while the llot us dry. .....after all this is Nigeria, let's not fool ourselves!!!! 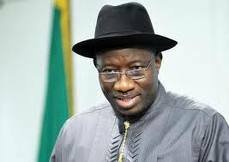 jonathan is just another thief we can not afford to tolerate.i expected that he will fix the power problem and he needs not to campaign.that is what anyne can give us now. WOW..30billion Naira into Entertainment industry..HMMM Nawaoo Ok.
swindling ripping off artist both upcoming and established once. 4. No statistics ...need I say more!